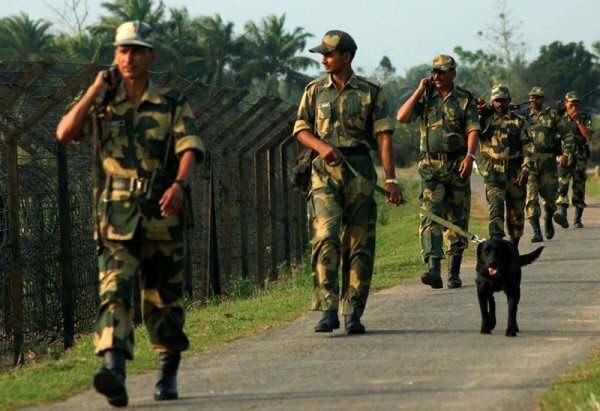 India’s Border Security Force (BSF), which guards the India-Bangladesh border, has announced that it is offering yoga and meditation sessions to its personnel in the Guwahati region as a way to combat stress. The Guwahati frontier office monitors India’s border with Bangladesh in Assam and Bengal, according to NDTV. It recently partnered with the Rani Laxmibai National Institute of Physical Education and organized a three-day meditation camp beginning on June 13; 15 officers and 90 other BSF personnel attended. The new program was begun as part of the BSF’s 50th anniversary celebrations, says NDTV, but also because of the increasing stress experienced by the organization’s personnel. A BSF spokesperson told NDTV that meditation programs have been observed to help personnel cope with their hectic duties and isolation from their families. India and Bangladesh’s relationship is characterized by a “lack of mutual trust, misunderstandings, and conflicting ideological stances taken by parties in both countries,” according to a recent Forbes article. While yoga may not heal the rift between the two countries, it might at least help the people manning the border. In May, the BSF also trained 56 of its staff in yoga and meditation, including 16 women who will act as teachers for other personnel stationed at the border in stressful locations. This isn’t India’s first foray into de-stressing police officers, military members, and other stressed citizens, however; recently, a local police chief in India decided that daily meditation and yoga would help his officers improve their attitudes and careers. The country’s flagship airline, Air India, has begun offering mandatory yoga classes to all its new pilots and cabin crew in training. Prime Minister Narendra Modi has even begun a nationwide initiative to extend yoga into civic life, with the goal of bringing regular yoga practice to schools, police training centers, and hospitals. By bringing yoga to people who experience high levels of stress on a daily basis, India aims to not only promote yoga’s identity as an ancient Indian spiritual practice, but also to take advantage of yoga’s myriad health benefits—mental, emotional, and physical. What do you think? Should all high-stress jobs offer yoga to their employees?